20 x 20 Truss displays offer an innovative, functional, and bold design to your trade show display. 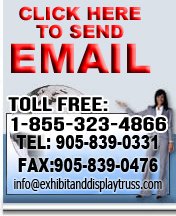 All of our exhibit display booths are professionally manufactured to ensure stability and ease of installation. 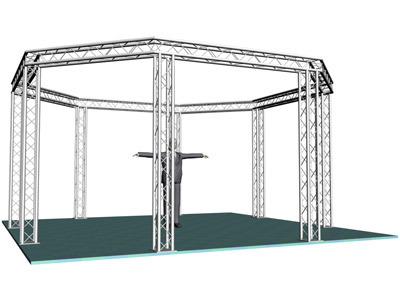 Our unique truss systems are perfect for any trade show display and can be custom designed to suit your companies needs. Most in stock aluminum truss systems can be found in 2, 3, or 4 chords. Please call us with any questions about our truss systems or custom truss design information. This 4 chord 10 inch profile truss structure is octagon shaped for displaying your signage from multiple angles of a trade show room. Placing an order for an aluminum Exhibit and Display Truss is easy ! 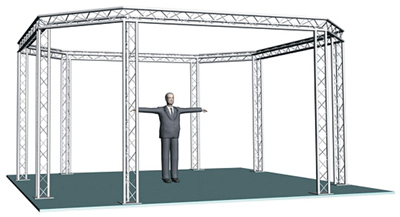 Select from one of our many exhibit or display layouts in 2,3 or 4 chord truss. You can either fax, phone or email your choice in to the order desk. Click Here for Contact Information. You can customize your truss and exhibit displays by adding truss components and pieces to suit your needs. Take a look at our 12 inch exhibit and display components. Remember, you can contact a representative at any time to discuss a custom truss design that would work for your individual needs!